This Lester automatic 36 volt EZGO golf cart battery charger is designed specifically for use with 36 volt EZGO golf carts manufactured from 1995 to present day. Though most newer golf carts from any manufacture are 48 volt. So if this is not the correct golf cart battery charger for your cart scroll down the product page to view other options or look to the left side of the screen to find the Lester Electric golf cart battery charger page with the complete line of golf cart battery chargers by Lester. They are available with a wide variety of DC plugs, making them compatible with most golf cars and utility vehicle models, including those from E-Z-GO, Club Car, Yamaha, and other leading vehicle manufacturers. All Links Series chargers are MADE IN AMERICA. Factory Sealed box includes (1) One 36 volt EZGO golf cart battery charger with required TxT Textron Power Wise 2-pin plug. 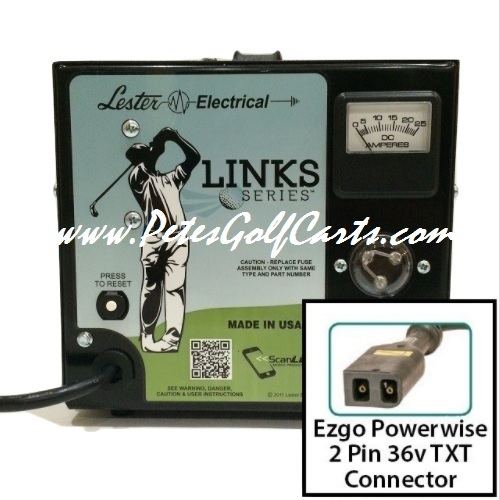 The Lester 36 Volt EZGO Golf Cart Battery Charger is the perfect charger for your golf cart. This Lester Links Series 36 volt EZGO Golf Cart Battery Charger is designed specifically for use with the EZGO Freedom or EZGO TxT golf carts manufactured in the year 1995 to present day. Also compatible with all other golf carts that operate with a 36 volt battery system and utilize the 2 pin “D” Shaped connector. This Ezgo golf cart battery charger – 36 Volt – 21 Amp is part of the all new Lester Link Series line up. Lester has been manufacturing battery chargers and charging technology for decades but this year they have out done themselves. the new Links Series Chargers were designed specifically for use with golf carts and all the typical problems associated with personal ownership of a golf cart or EV. Maintaining the golf cart and its battery system is always a concern among owners. Mainly because the traditional lead acid style batteries they operate on have one big inherent problem. this unit is a direct replacement for your OEM Powerwise Golf Cart Charger. No need to set a timer or any such thing – plug it in and forget about it. Automatically shuts off – once batteries are charged. Peace of mind is what the new links series of chargers from Lester Electric offers. They are available with a wide variety of DC plugs, making them compatible with most golf cars and utility vehicle models, including those from E-Z-GO, Club Car, Yamaha, and other leading vehicle manufacturers. Due to Lester Electrical’s unrivaled reputation for quality, reliability, and innovative charge algorithms, the leading golf car manufacturers have made our company a trusted supplier for over 50 years. MADE IN AMERICA. Pete’s Rule of Thumb – When it comes to electrical devices it is always better replace with a new one. Mechanical stuff can be rebuild and usually never an issue. Electronics – another story completely. Once they start acting up they are never the same or reliable. Your charger is the life blood of your electric golf cart. Don’t settle or compromise for anything less than the best.